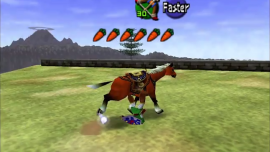 To kick off this year’s Zelda Month, PeanutButterGamer has made a video of different hacks and glitches for The Legend of Zelda: Ocarina of Time on a Nintendo 64 simulator. He tries out tons of different glitches, like making Link fly or walk on water, as well as messing with the sizes of Epona and different CPUs, and finally just bugs out the game in a bunch of funny ways to try and see what happens. Zelda Month is an annual event of his, where he makes videos exclusively about Zelda (his favorite video game series) all throughout the month of November. Most famously in the past few years, he’s made a list of the Top Ten Zelda Games, and for the Top Eight Zelda Dungeons, and also looked at the infamous Link: The Faces of Evil for the CD-i. What do you think? Are you excited for the rest of his Zelda Month videos? Let us know in the comments!